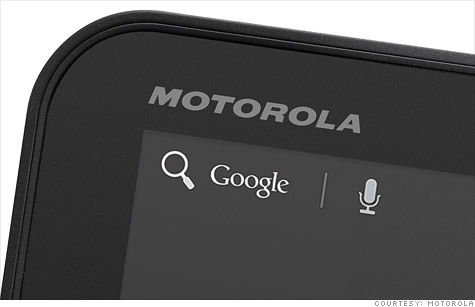 NEW YORK (CNNMoney) -- Google officially completed its $12.5 billion purchase of Motorola Mobility on Tuesday. It's a watershed moment for the company, marking both its biggest acquisition ever and Google's transition from a search-and-software company to a consumer gadgets maker. Google named Dennis Woodside, who previously served as president of Google's Americas region and oversaw the integration planning, as CEO of Motorola Mobility (MMI, Fortune 500). Sanjay Jha, the Motorola Mobility CEO who architected the Google takeover, is stepping down. First announced in August 2011, the deal passed regulatory muster from both U.S. and European antitrust commissions despite concerns that the combined company might unfairly withhold patent licenses from its competitors. Buying Motorola gives Google (GOOG, Fortune 500) access to more than 17,000 patents, plus an extra 7,500 that are awaiting approval. The search giant said it plans to use those patents to ward off lawsuits from Apple (AAPL, Fortune 500) and Microsoft (MSFT, Fortune 500) that threaten Google's popular Android mobile operating system. But some industry experts believe that Google is after much more than a patent mine. It's now playing in Apple territory. Buying Motorola gives Google the ability to control both hardware and software, by making its own integrated smartphones and other devices. "With this acquisition Google can also come up with equivalent of Apple TV, Roku, and tablets," says Sandeep Aggarwal, an analyst at Digital Route. Hardware has become an important arrow in tech companies' quivers -- it helps keep people within a software company's ecosystem. Amazon (AMZN, Fortune 500), for instance, bundles its e-books and media with its Kindle e-readers and Fire tablet. Google has already inched in that direction by building a prototype in-home entertainment device, working with Intel (INTC, Fortune 500) and TV manufacturers to make Google TV, and partnering with HTC and Samsung to design its annual Nexus smartphone. Google receives bids and proposals from various handset manufacturers to make the Nexus device, which comes out every year during the winter holiday season. Many Google analysts assume Motorola will be used to create "showcase" smartphones and tablets like the Nexus. The company could try to spark innovation among its other partners by challenging them to match Motorola's flagship devices. "Google will be a boutique manufacturer with things like the Nexus to say to its partners, 'Look at this awesome stuff we've made; you should do something like this,'" says Whit Andrews, analyst at Gartner. But Google will have to walk a tightrope. Its Motorola unit -- which Google says it will operate as an independent subsidiary -- has the potential to anger licensees like Samsung, HTC, and LG, which rely on the Android operating system. That's why some analysts believe Google won't aim to be the next Apple. They think Google will keep Motorola at arm's length, relying on it to drive innovation in the Android platform but not letting it become a primary company focus. "Google could become a hardware manufacturer, but I don't think it will," says Andrews. "Google will continue to vigorously pursue its core business, which is selling advertising." There's a clear advantage in that approach: Google's profit margins are much higher than Motorola's. Staying focused on what already works is the safe way to go. But in the year since he took over as CEO, Larry Page has illustrated that he's got grand ambitions for Google and the willingness to make radical changes in pursuit of them. Hardware is a big new field of opportunity for Google -- and Page and Co. now have a $13 billion new weapon for attacking it.